Stacey Thompson was thrilled when she was offered a service dog to help control her PTSD. Little did she know the dog would make her symptoms worse. Thompson is a Marine veteran who was raped by her sergeant and still deals with the trauma and anxiety from that attack. She's also a motivational speaker who was approached after one of her speeches by a man from Labs for Liberty. He told her his non-profit wanted to give her a service dog. Thompson was invited to bring her husband and three children to Liberty Outpost in Morgan County, Utah, for a vacation and a chance to talk about the service dog Labs for Liberty wanted to provide for her. Three months later, Reef was born. The chocolate lab was trained by a volunteer in basic obedience and also for various tasks to make Thompson feel less anxious when she left her Oceanside home, especially when she traveled cross-country to make speeches. Thompson met Reef twice before he came home with her for good. He was 8-months-old. News video of their meeting at the Salt Lake City International Airport showsReef putting his paws on her shoulders when she bent down to pet him. Thompson says she now realizes that was a red flag. The Marine veteran spent the next several days working with Reef and a trainer at Liberty Outpost. She told Team 10 everything seemed fine until she got home to Oceanside and realized that life in Southern California has a lot more distractions than a life on the prairies of Utah. "I didn't know what I didn't know," said Thompson, who soon realized that she couldn't take Reef for a walk at the pier or the park without having him react by barking and lunging at passing dogs and strangers. There was no way she could take him through airports as she travels across the country delivering speeches. At home, Thompson said Reef would stand on his hind legs, putting his front paws on her shoulders and attempting to mount her from behind. "As a MST (military sexual trauma) survivor, it is completely inappropriate," she said. Labs for Liberty Founder and President, Joan Nold, told Team 10 that Thompson never reported the behavior to her. Although she said the non-profit had more than 30 conversations with Thompson as they tried to help her continue to train Reef. At one point Labs for Liberty agreed to take Reef back to Utah for remedial training, something Thompson initially agreed to but then decided the terms of that extra training didn't meet the needs of either her or Reef. Nold told Team 10 it was Thompson who insisted they let Reef come home with her at such a young age. Nold said Labs for Liberty hadn't planned on pairing the veteran with Reef until he was closer to a year old. "She was quite insistent that she really needed Reef," said Nold. She claimed she warned Thompson that Reef was still a pup and would need continuous training. "She kept assuring us that she could handle that, especially with our support," Nold recalled. Thompson says the support wasn't there. "You call their one trainer, and they have up to 72 hours to get back to you," she said. "That doesn't work when I've got a live animal who's doing behaviors that are not only anxiety-provoking, but frightening." Thompson added an "in training" patch to Reef's service dog vest and decided that - until he's properly trained - he'll be a family pet. She claims she is not alone. Thompson started a private Facebook page for other veterans with similar experiences. 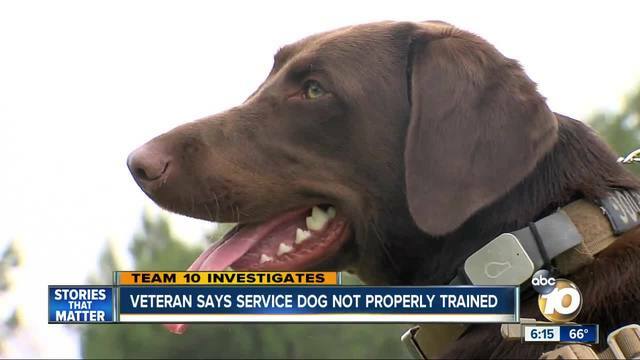 She says she's been contacted by six veterans who share her frustrations after being paired with dogs that aren't service-ready. She decided to go public because she wants to make sure no other veterans find themselves with service dogs that make their lives more difficult. "The brothers and sisters who served do not deserve to have the expectation of bringing home a service dog that will eventually cause them more anxiety, more hyper-vigilance, more stress," she said. "That can put them in a place where again they're having suicidal thoughts, they're thinking about going back to drugs and alcohol, or….that is not the purpose of this." Thompson says she's grateful to Labs for Liberty for bringing her together with Reef, but said a veteran's mental health is of "utmost importance" and placing dogs that aren't fully trained with them isn't helpful. 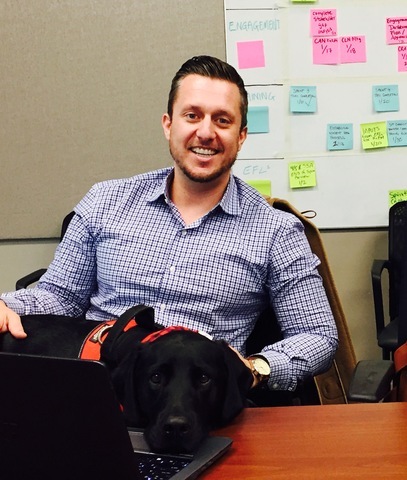 Labs for Liberty has paired 45 veterans with service dogs in the past two years. Nold says they have a 95% success rate. "Our veterans get the satisfaction of helping to polish their own dog," said Nold. "We believe no dog is ever fully trained." Nold called what happened with Thompson "a misunderstanding of expectations." Labs for Liberty is severing its ties with Thompson at Thompson's request. "We wish her the very best. We want her to heal and be whole and move on and we know she'll take good care of Reef and so that gives us comfort." Matthew Matlock contacted Team 10 after learning we were preparing a report on Labs for Liberty. He said his experience was 100% positive and that he believes in the non-profit's mission to help veterans live normal lives. Matlock served 12 years in Air Force Special Operations, including three deployments. During the last deployment members of his team were killed in action. When he returned home he described himself as troubled. He struggled with depression and anger. Then he contacted Labs for Liberty. Matlock was paired with a 7-month-old black lab named Willis. Matlock acknowledged Willis was not a finished product, but he accepted that because he believed he needed the comfort of a service dog as soon as possible. "We grew together as a team," Willis told Team 10. From day one Matlock took Willis to his classes at UC Berkeley. They graduated together. Matlock now works at a San Francisco consulting firm. Willis is at his side every minute of the day. Matlock said he's not sure he would have survived if he'd had to wait two years to have Willis by his side. He said Willis and Labs for Liberty helped him adjust to life - something his family members noticed. They told him he was more relaxed and began smiling again once Willis came into his life. Thompson and Reef are now working with a local dog trainer. Carol Dupuis told Team 10 that Reef isn't ready for his veteran owner. She said Reef needs another six months to a year of training before he can be considered a real service dog. "When you give a dog to someone who doesn't know anything about dog training then the dog gives her instruction," Dupuis said. " And it doesn't work." Dupuis is helping Thompson and Reef free of charge.